Originally published in The Clarinet 44/1 (December 2016), this online version contains embedded content. Printed copies of The Clarinet are available for ICA members. 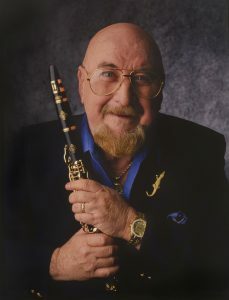 Pete Fountain was fond of the large-bore clarinets for their warm sound and because he had been listening to Irving Fazola (Albert System) and Benny Goodman (Selmer large bore). Sidney Forrest also performed on a Series 9* Selmer before moving onto Buffet model clarinets. It did not take long for LeBlanc to notice the incredible Pete Fountain performing nationwide on TV, and they constructed a Pete Fountain model LeBlanc that featured a large bore with six rings, articulated G-sharp key and gold plating. One time in the mid-1990s, Pete’s mouthpiece tip broke off and he sent me the little pieces from the tip fracture. It was between Christmas and New Year’s when he had a week-long break, which put time pressure on me. I used plumber’s epoxy, and coupled with some larger fragments I reconstructed it better than new. However, I secretly took this opportunity to precisely flatten and polish the mouthpiece table, and refaced some of the rail to restore his numbers but opened the tip up from the original .045 inches to about .047 (1.14 mm). I told no one. I play-tested it with some reeds that I had been making for him over the years and knew his mouthpiece was now much better than before, but I never told him what I actually did because I did not want to spook him with my changes. Fearing that the epoxy could fail onstage, I also made three more crystal mouthpieces from stock Vandorens that I thought were actually better for him, and jumped a plane and delivered them to his house… all in 72 hours. The look on his face as he play-tested each one was priceless. Suddenly I actually felt “useful.” I made him promise not to perform on the epoxy-repaired mouthpiece but to carry it in his case as a backup in the event the other mouthpiece broke or got lost. He never used it again to my knowledge. Pete played on a soft reed, the same as Benny Goodman. I made reeds for Pete for many years and his reed was about a 1.75/2.0 using Vandoren strengths as a reference. I used a Vandoren 5 while studying with Sidney Forrest but Pete said I had to make a choice between a hard reed for the legit sound or a softer one that would let me “slide into and out of a note to impart emotion.” Knowing I had Sidney at the other end, I compromised down to a 3 without Sidney knowing it, but used a larger mouthpiece tip. To see Pete’s fingers using his six-ring clarinet to perform this pattern on yet another tune, “Tiger Rag,” see the video below called “The Lawrence Welk Show: Tiger Rag.” At 1:37 you will hear Pete clearly play high B-flat and start the ending of the song as the camera moves in on his hands. Note well the ease of performing this difficult passage and how smooth he performs it. Nothing to it – right? The wonderful part of “Tiger Rag” was Pete’s low register solo, which can be heard in its recorded version below. 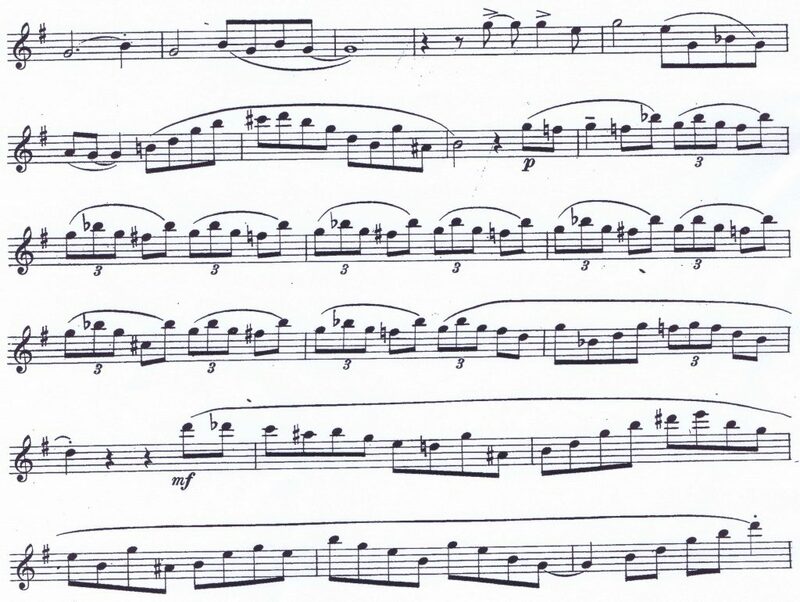 The transcription for this challenging piece of music, including the second solo (starting around 1:20), is provided below the recording for anyone that wants to try to play along. It is a great exercise in rhythm and phrasing to execute this at the tempo Pete uses, and notice that Pete plays the full, nearly four-octave range of the clarinet with ease. Actually, it was Pete’s performance of “Tiger Rag” – not only on “The Lawrence Welk Show” but also on the Johnny Carson show (where Pete performed 59 times!) and the Ed Sullivan show – that helped pushed him into mainstream music and stardom. During the time period of 1957 through 1959, Pete Fountain swept America with his clarinet sound and his style of music. His clarinet music was all the talk in school hallways and he was just “super cool.” Untold tens of thousands of kids wanted to play the clarinet, including me. An offbeat performance of “Mr. Clarinet Man” that also captures the 1950s USA is below. Notice how well he weaves the clarinet between the vocal parts, never playing over them like so many instrumentalists do. Gregory Harrison, Ph.D., P.E., is a forensic engineer by day and jazz clarinetist by night. He studied clarinet privately with Sidney Forrest for 17 years and with other teachers during the summers when Sidney was at Interlochen, Michigan. He has known Pete Fountain since 1970, and often hand-made reeds for Pete to perform on. Greg has performed onstage with Pete Fountain many times. YES. HE WOULD GIVE ME MANY BOXES AND I WOULD WEED THEM OUT AND THROW 50% AWAY AND THEN MODIFY THE REST BY HAND OR USE MY REED DUAL THEN TOUCH UP. I PAINTED THE ENDS OF THE REEDS WITH FINGERNAIL POLISH TO RETARD SALIVA MIGRATING UP THRU THE REED AND DIGESTING THE FIBRES. I BURNISHED THE TOP AND BOTTOM TO MAKE THEM WATER RESISTANT. That is a most interesting article. Could you explain the way you modified the reeds in a little more details and what it was about the mouthpiece design that gave Pete that fine and unique tone. Pete of course but with good materials. Thank you. Sorry about time lapse. didn’t know there was a comment. MPC: they are all different from the mgfr and you have to acquire supply and experiment. I gave tip dimensions and lay in the article. I have tools and ways to measure mpc to see if it is going to be any good. I cant communicate that here. I prefer glass as it never changes like wood or plastic! Glass is superior conductor of sound! Glass gives power to the sound too because it is a conductor or energy whereas wood and plastic are “dead”. A big reason Pete had unique and beautiful sound is simply that he performs on large bore clarinet and not small!!! No modern clarinets work that way. To me large bore of 1950-1960 are wonderful and better than what is being built today. Now I happen to have an exceptional Buffet Prestige about 25 years old that makes it happen…..I don’t know why. Sidney Forrest loved it and said it was better than his! I bought two new buffet clarinets and then spent money having them tweaked but no cigar. Great clarinets for orchestra and Symphony etc. but not suitable for solo playing in small group like I do. I have a 1960 Selmer Center Tone that knocks out a beautiful warm dark gorgeous sound and is very much like pete’s sound….but Selmer CT is large bore! So, I carry both with me and pick one depending on conditions in a room. Buffet Prestige? I don’t need a microphone!! Selmer is small room is OK wo Mic. But both clarinets are super. Selmer cost me $800 BTW and I found it at Clarifest 2014!! I am a lucky boy for sure….couldn’t believe how it played. Seller was SAXQUEST out of MO state. Too technical to just write out yet another in depth article…..you can look me up and call me. that would be more time efficient…….sorry for delay but just found this. Please clarify the O’Brien scale. Is it in millimeters or 2 times millimeters ? Do you happen to have the full Tiger Rag sheet music by Pete Fountain? Very nice and valuable article for people who looking for media transcription and not only for transcription seekers but also Transcriptionists. media transcription, by your acknowledgement gather some details. Recently i was looking for transcription for some article so, i was make search on google which give some websites Synergy transcription services, Treo and Donee. By the above result Synergy transcription services gives best result and turn around time. So i completely satisfied with their service. After that i was getting more transcription service by them like Movie transcription and voice transcription.